Elegant theme is not exactly a single theme, but it is comprised of different themes. Elegant themes have been made by renowned, reputable and recognized wordpress theme developer Nick Roach. Nick Roach has been making wordpress themes for quite some time now most probably would be around 7-8 years. The amazing thing about elegant themes is that; you have a lot of choices, so no matter what business or online business you are in, elegant themes got you covered, and with very affordable price. So, it’s not only your source of high quality and well designed wordpress themes, but it’s also the most affordable wordpress themes membership ever. Elegant Shortcodes: Adds tons of short codes to your wordpress post editor, & makes it easy to add an stylish touch to your content. By this awesome plugin you can create content boxes, toggled content, tabs, pricing tables, tooltip, image slider, icon & web buttons & more. Elegant Page Builder: This is my second favorite plugin among four! Provides drag & drop functionality to create killer landing and squeeze pages. HandHeld Mobile Plugin: Though all their themes are mobile responsive but you can use their HandHeld Mobile Plugin to make any site mobile friendly it doesn’t matter what theme you are using! Maintenance Mode Plugin: Allows you to easily create Coming Soon page for your upcoming site before its official release. Let your visitor know about your next new project and connect with them with email & social network! Elegant themes support is fairly good I will say. I’ll give them 4.5 out of 5 as far as support is concerned. Usually they’ll get back to you within a few hours with your query answer. But in some cases you may have to wait few more hours to get a response from them. Elegant themes offering limited time discount for its membership plans. 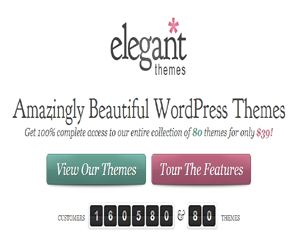 You can use elegant themes coupon to save 20% on its developer and lifetime membership plans.